Today we continue to explore the prominent temples of the Bhimasena Cult in the Kathmandu Valley. Before moving on to the Bhaktapur Temple, we'll give brief mention to the Bhima Temple in Kathmandu Valley, built in 1140 A.D. Known as Bhimsen Sthan, it resides in Ward No. 20, Kathmandu, and survived the 2015 earthquake. This temple is dedicated to Bhima, Arjuna and Draupadi, and is said to be the place of Bhima's birth. Like the Bhima deity stone described yesterday, which resides in the Bhimasena Dolakha Temple in Durbar Square, Bhima's presence at this Kathmandu temple is also steeped in local legend. It is said that once, a Thakuri king pointed out the lack of productivity of a farmer who used to lay about at the local inn. In order to challenge the king's disapproving complaints, the farmer completed an amount of field work in one day that would have taken a thousand hands to do. Eventually the farmer with supernatural powers revealed his true identity, as Bhimsen. A temple was erected in his honor in 1140 A.D. In the image above of Bhimsen Sthan, we again see the pataka, by which the gods ascend to the heavens, although this one is not supported by nagas, like the one at Dholakha Bhimasena Temple. However, in many Bhimasen temples we find the naga motif. As previously mentioned, the nagas are typically engaged in guarding wealth, and Bhimasena Cult temples are often associated with business and wealth. But in the case of Bhima worship, the naga presence may symbolize another pastime. 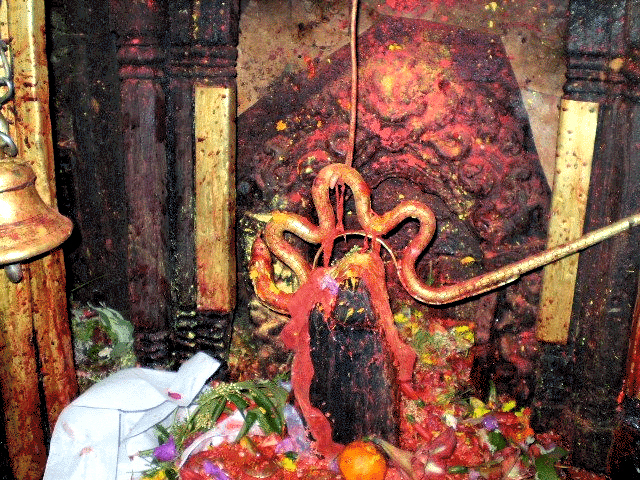 In the Bhimasena Dolakha Temple we see that a naga hovers over the deity stone, forming a protective shield above Bhimsen's head. This may be related to the narration in Mahabharata 3,176-78, which describes a pastime wherein a viper attacked and afflicted Bhima in the forest area of Visakhayupa, situated at the source of the Yamuna River. The poisonous snake attacking Bhima is identified as the Naga king, Nahusha, a son of Ayus (Pururavas), the first king of the Lunar Dynasty, who is thus considered a forefather of the Pandavas. Scholars say this pastime raises doubt as to whether the lunar race of kings originally branched from the Naga race of kings. Many kings in the line of Purus and Kurus, all being branches of the lunar race, like Dhritarashtra and Janamejaya, are also mentioned as Nagas at various places. The Kuru city Hastinapura is sometimes referred to as Nagapura ('the city of Nagas'). There is also a well known Bhima legend in Uttar Pradesh, where the Naga Jats have many villages. It is said that in the ancient village of Ahar, Bhima was poisoned by Duryodhana and thrown into the Ganga River. It was the Nagas who saved him. In fact, there are so many pastimes of Bhima which are associated with nagas, that we cannot begin to mention them all here. Suffice to say, there are many reasons the naga motif may have been incorporated into Nepal's Bhimasena Cult temples. 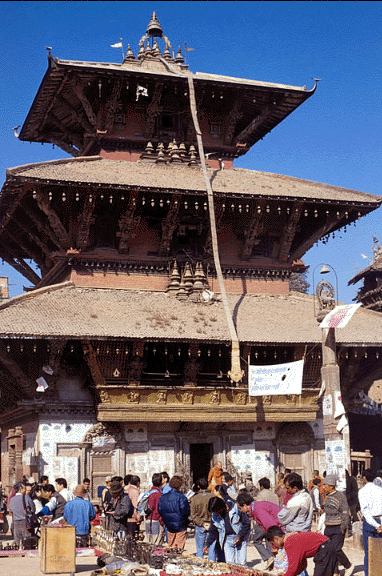 The 15th Century Bhimasena Temple of Bhaktapur stands in the middle of Tachapal Square. On the west side of the square is a Dattatreya temple and likewise, a Dattatreya temple sits close to the Patan Bhima temple. In front of this Bhimasena mandir is a stambha with lion mounted atop it, much like the one at Dolakha. Bhaktapur, previously known as Khwopinggram, is an ancient Newar town in the east corner of the Kathmandu Valley. It is the third largest city in the valley and during the late 15th Century, was the capital of Nepal under the rule of the Malla Kingdom. That the Bhimasena Cult was well established in all the major cities of Nepal, as evidenced by their prominent temples, underscores the influence of the Mahabharata Period in the region.